With Sky Go Extra you can watch live and on-demand sports events depending on your Sky TV subscription. Watch Sky programming however you like on your compatible mobile, tablet or laptop wherever you are in the UK & Ireland with an internet connection. You can download shows on up to 4 compatible devices and watch live content on two of them at the same time. 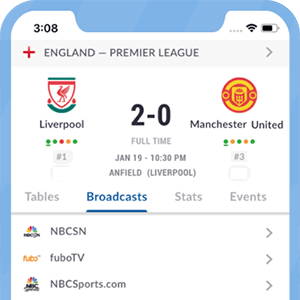 *Got itLive Soccer TV does not provide SKY GO Extra live streaming. The information provided on this page is simply SKY GO Extra soccer TV schedule.